CHAPEL HILL, N.C. (AP) — Leaders of North Carolina’s flagship university were given a three-month deadline Tuesday to figure out how to preserve — and where to put — a Confederate monument torn down by protesters. The resolution approved by the board that oversees the statewide university system doesn’t indicate whether University of North Carolina leaders favor returning the statue known as “Silent Sam” to its former location in a main quad of the Chapel Hill campus. The statue was torn down during a protest a week ago. The Board of Governors’ resolution simply directs the Chapel Hill campus chancellor and trustees to develop a plan for the statue’s “disposition and preservation” by Nov. 15. 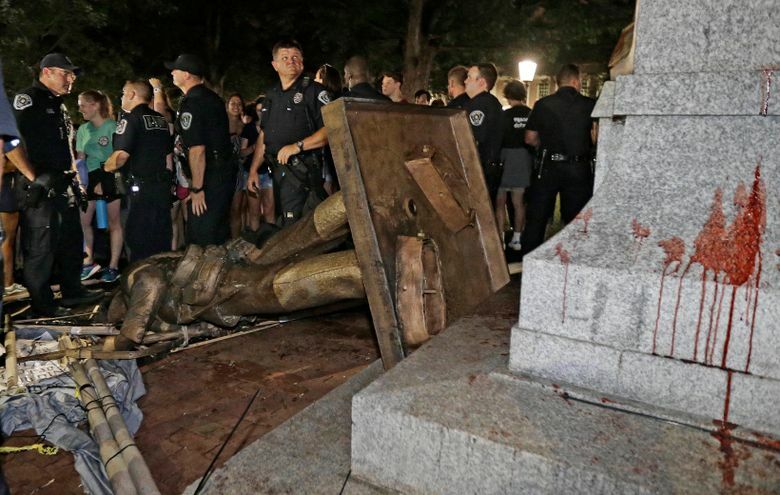 The statewide board and the Chapel Hill trustees held separate meetings behind closed doors to discuss legal options for dealing with the aftermath of the statue’s toppling on Aug. 20. After the meetings, University of North Carolina-Chapel Hill Chancellor Carol Folt told reporters that university leaders will consider “all options” of where to put the statue, including possibly displaying it again on campus, with an aim of balancing visibility and access with public safety. The bronze statue is currently in temporary storage in an undisclosed location. Every Board of Governors member who joined the meeting voted in favor of the resolution except for Thom Goolsby. The lawyer and former state legislator has argued the statue should be swiftly returned to its pedestal in the quadrangle known as McCorkle Place. “I cannot support the motion as it is written. I believe the time frame is too long especially in light of the violence, the ongoing threats and the continuing danger on our college campuses,” he said before the vote. The Board of Governors also approved an external review of the university’s preparation for the protest and the police response. The statue was yanked down on Aug. 20 after several hundred demonstrators gathered on the Chapel Hill campus, protesting what they consider its racist symbolism. They raised banners to conceal people tying the rope, and marched into the streets to draw officers away from the statue, according to videos. Officers also were less confrontational than they were at a similar protest a year ago. So far, three people accused of helping tear the statue down face misdemeanor charges of rioting and defacing a public monument. Arrest warrants said they damaged it by “pulling it down from its base,” but the warrants don’t elaborate on what else investigators know about how protesters executed their plan. One of the three is scheduled to appear in court Thursday and the other two next week. A fourth protester was charged with misdemeanor counts of resisting officers and wearing a mask before the statue came down. Seven others face charges related to a protest that happened on Saturday, after the statue’s toppling. Several appeared in court Monday.